I was never really looking for this single, but I think this is the first time I actually saw it, and I bought it right away. This is the track my wife and I talked about when I showed her my record collection for the first time. I didn't have it, and she instructed me to download it so we could dance to it. And so I did, of course. It's good to have a physical representative of this track now. 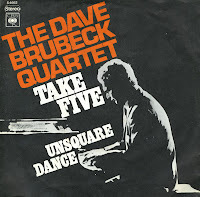 'Take five' was written by Paul Desmond and recorded by the Dave Brubeck Quartet on their 1959 album 'Time out'. This piece became one of the group's best-known tracks, famous for its distinctive, catchy saxophone melody and use of the unusual quintuple (5/4) time, from which its title is derived. This single was made in Holland in 1969, but in the Dutch chart, it reached number 9 in 1962.